Skye Gravestones | Uig Burial Ground. 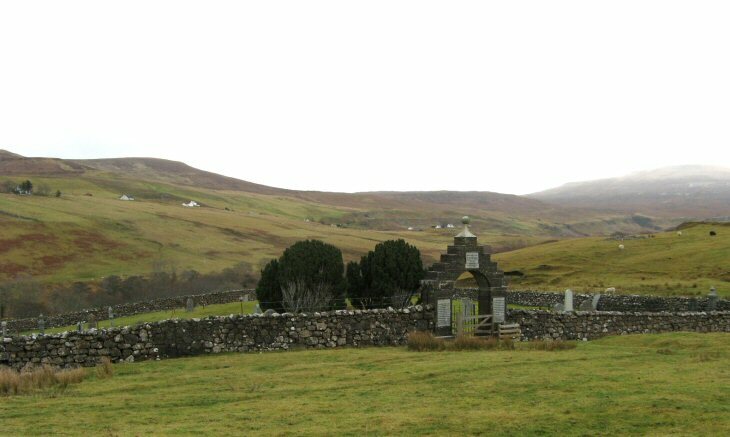 This burial ground sits high above Uig Bay. It is served by a track which rises steeply from the main road near the church and the hotel. Added by Lorna Thomson (macpherson). on 03 February 2015. Thanks for your research and shared information. My McKinnons came from Skye. Some say from Uig...others Kilmallie. My great great grandfather Ewen McKinnon was born on Skye in 1789 and died in Prince Edward Island in 1855. Anyone know where his folks lived? Believe they were Donald or John McKinnon and Catharine McLean??? Added by Clarrie MacKinnon on 12 August 2016. Hi Clarrie, I've been reading about john McKinnon and Catharine McLean. I'll try 'chancing this info again for you. Added by Terese on 01 February 2017. Thanks so very much. Greatly appreciate your correspondence and possible connections . Intend visiting Skye in 2017. Please keep in touch. Added by Clarrie MacKinnon on 06 February 2017. I'm seeking info on the McLeods (father Norman b 1762, sons Murdoch, Roderick, and Neil, and three married daughters) who were probably on the same ship as your ancestors, Clarrie. The Mary Kennedy carried 85 heads of households from Uig, Skye to Prince Edward Island in 1829. Added by Jane on 17 August 2017.